It's winter here where I live, so I've been craving bright colors, so I went with raspberry colored daisies! Why not! I colored Daisy Bucket with Faber Castell Polychromos pencils. The easel card is an SVG files from My Scrap Chick. It makes a very elegant card, doesn't it? The sentiment is from Hot Off the Press. I hope you take time to check out all the New Releases today at DigiStamps4Joy. You won't be disappointed in the fantastic talent from the design team, or the new digis in the store! A new challenge just started at DigiStamps4Joy on March 1. It's Anything Goes, with an optional theme of "being Young". It goes until March 31, so I hope you can join in the fun! 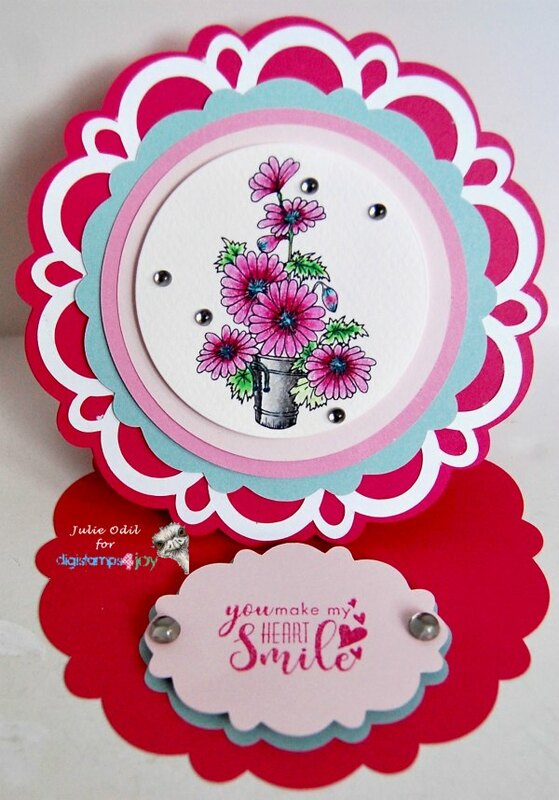 Julie, beautiful easel card with a great image. So happy you played and your card is amazing! This is such a pretty card Julie. Beautiful color combination too that I would never have thought of. Such a pretty fancy fold card! Easel cards are always a hit with the recipient. Thank you for playing along at Brown Sugar Challenge. Cheers to a Lovely Friend! Always be Brave Enough to Fly! Tearin' It Up -- for Scribbles Designs! !